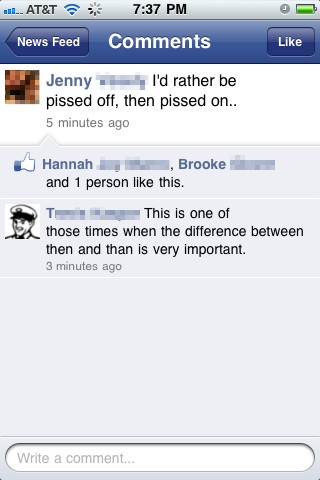 My Typo Humour: Than or then? A comparison? Or a time? Another Facebook gem from Greg L.
I had no idea that this was such a big issue but, according to the web site thannotthen.net (yes, there's a web site dedicated to the subject) a significant percentage of people aren't aware that the two words have different meanings. But, as T says above, the difference is very important. It changes Jenny's preference to a request. And, if it's fulfilled, she no doubt becomes simultaneously pissed on and pissed off.